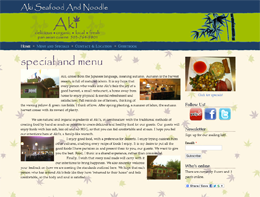 Drupal excells particularly well with restaurant and food related websites. You'll of course want to let your customers know where you are, what's on the menu, maybe a daily specials page, and if your restaurant has events you'll want a robust powerful event calendar, all included with Digital Immersion's Drupal package. Also included is an email newsletter tool and all the social networking bells and whistles, so your customers can tell each other via social networking just how great you and your food is. Shown here (to the right) is Aki's Cuisine.